With The CustomControl option you can now design and deploy your own custom control interface. This greatly simplifies system operation and visualization. This is accomplished with a simple, intuitive graphic editing tool, no programming required. This greatly simplifies system operation and visualization. This is accomplished with a simple, intuitive graphic editing tool. 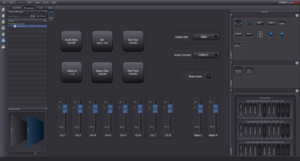 Designing a custom control interface could not be easier, LYNX provides you with an intuitive PC editor. 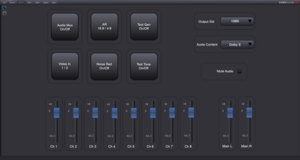 Simply drag and drop the desired control into your workspace and assign the control to a specific module function. A custom control interface can be as simple as a solitary button or slider, or a complex multi-level control surface with many integrated controls. There is virtually no limit to the design possibilities. 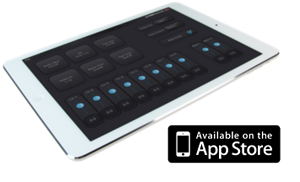 Custom control panels can be deployed to any device on the network, and portable wireless access is possible using our our free iPad application, which can be accessed from the Apple store. 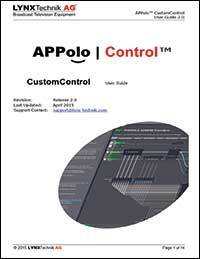 Design and deploy as many custom control designs as you like within your APPolo network. The virtual control panels can be assigned to one or more users. Available as software option (OC-SERVER-CUSTOM CTR) for the OH-RCT5023-SERVER. Can be activated at any time.